'Girl Trouble' (Lowell Baumunk, R. 2011). Seedling# A91C. TB, 41" (104 cm), Early midseason bloom. Standards lavender, lighter center; style arms lavender with darker highlights; falls white, purple plicata marking, 3/8" purple band lined with speckles, purple speckles around beard extending to margins of falls, purple stripe extending more than halfway down the fall from the beard; beards yellow in throat blending to lavender-white at end. 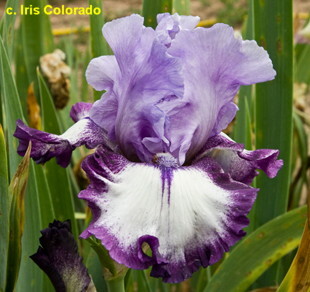 Seedling# 297B: ('High Priestess' x 'Elizabethan Age') X ('I Feel Good'. Stout Gardens 2012.